Emma Goldman– Speaking out for Free Bread, going to jail. 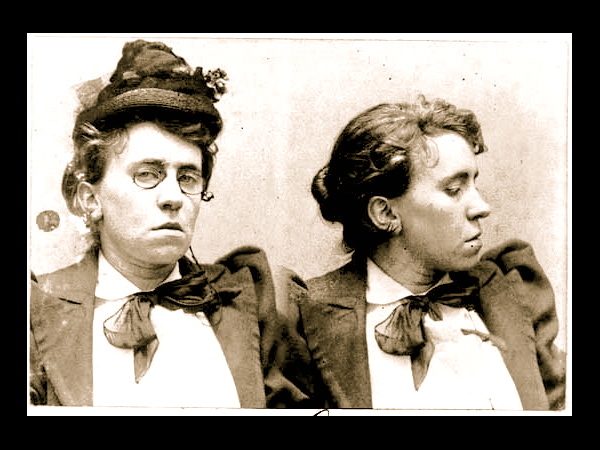 PART I.
Emma Goldman, seen in her police mug shot after being arrested in 1894. Over three thousand people crammed themselves into New York City’s Union Square on that hot, sticky summer day, August 21, 1893. They carried red flags – symbol of socialists, nihilists, anarchists, and laborites around the world. Most of them wore rags and smelled from sweat. Most still spoke immigrant languages — German, Russian, Yiddish, Polish, and Italian — that sounded like menacing gibberish to native Americans. Three months earlier, Wall Street’s Panic of 1893 had sent the US economy crashing into depression, throwing hundreds of thousands of men – bread winners – out of work. In 1893, long before government safety net programs, this meant starvation, poverty, disease … and anger!!! The people in Union Square that day wanted to scream rage and demand their rights. They wanted a voice, no excuses, no apologies, no whitewash. And they knew they could trust finding it in their favorite rabble-rouser, Emma Goldman. 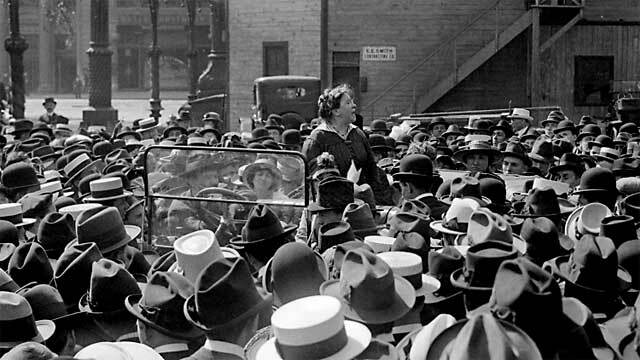 Emma Goldman speaking in New York’s Union Square, 1916. To the small goggle of New York radicals who filled the saloons on lower Fifth Avenue, Emma was held in “almost reverence,” as one put it: her confidence, her intellect, her clarity, her fearlessness. She never avoided a fight. When one rival got into an argument with her one night and called her latest article in one of the local socialist newspapers a fraud, Emma took a leather horse whip and lashed the man in the face. She had always been rambunctious. Born in 1869 in Kovno, Russia, Emma felt passionately about everything. As a girl, she starved herself once when her parents confronted her with an arranged marriage. She remembered once seeing a Russian official take a peasant, tie him up, and whip him in public. At the Gymnasium (high school) she attended in Konigsberg, Germany, she once stuck pins in the chair of a religious teacher she disliked. Coming to America in 1885, she settled with family in Rochester, New York, and became fascinated by radical movements of the era – especially the Haymarket anarchists in Chicago. She read voraciously. Already married and divorced as a teenager, she left home, moved to New York City, and quickly befriended the radical crowd at the downtown saloons – including her soon-to-be lifelong friend and lover, Alexander “Sasha” Berkman. Emma and Berkman took barely a few months to make their public mark. In June 1893, a strike at the Carnegie Steel plant at Homestead, Pennsylvania, had ended in pitched gunfire between strikers and Pinkerton detectives. Seven guards and nine strikers died in the melee. Emma and Sasha decided to make their statement by invoking justice on the oppressor, Carnegie Steel’s manager Henry Clay Frick. Berkman carried out the attack. He snuck into Frick’s office one day, shot him three times and stabbed him in the leg. Frick survived, and a court sentenced Berkman to 22 years in prison. 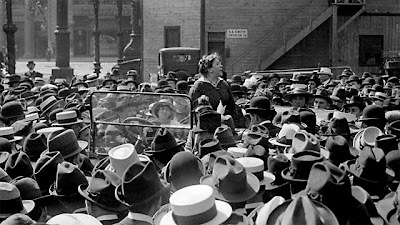 After this episode, Emma Goldman’s emerged as New York’s leading radical and anarchist. In speeches and articles, she refused to apologize for the crime. I n fact, she gloried in it. “The bullets did not kill [Frick],” she told one crowd in early 1893, “but others are being molded and they will fly with surer aim.” This was tough, in-your-face talk, the kind that police took seriously. Newspapers now covered Emma Goldman’s very word. They called her “Queen of the Anarchists” and “wife” or “friend” of the criminal Berkman. The printed rumors she was “said to have lived with different men” and “spent her time drinking beer” at taverns. “She was once good-looking,” said another, “but her record is not a savory one.” Admirers, on the other hand, called her a modern Joan of Arc. The crowd bellowed deafening cheers. What did Emma mean? Was she issuing a call to politics? Or a call to violence? The police (and the residents of Fifth Avenue) had no trouble figuring it out. To them, telling a mob of hungry people to invade rich people’s houses and steal bread had nothing to do with politics. It was incitement to riot, and an excuse to put Red Emma behind bars. A few nights later, as Emma was preparing to harangue yet another a crowd of 2,000 people crammed into Carpenters’ Hall in Philadelphia, police barged in with an arrest warrant, mounted the stage, and seized her. She “fought like a tigress,” one witness said, and men from the audience joined the free-for-all, throwing punches at the police to help her escape, but the police drew their guns. What happened next? Click here for Part II, The Trial.